Welcome to the new board! I hope everyone likes the new theme. It should be more responsive, faster, and provide easier and more fluid navigation. You should also find the posts easier to read, and have more space at your disposal. 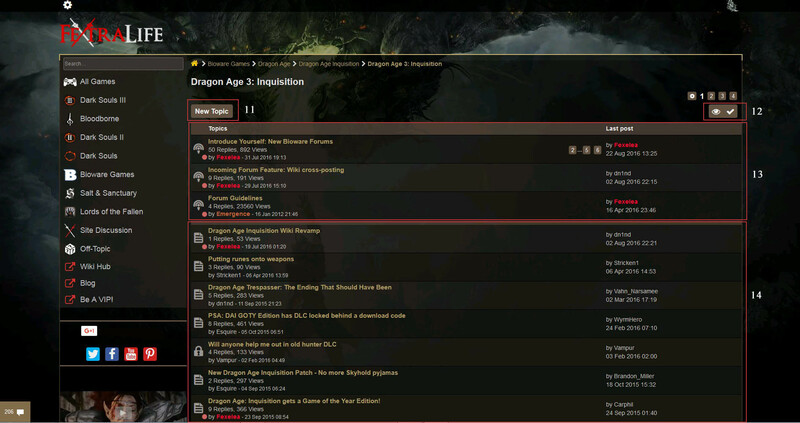 You can find all smaller sub-forums for ESO, Witcher, Fallout, Salt and Sanctuary, Demon's Souls, Dragon's Dogma, etc under "All Games"
This how-to navigates you through several forum options, and explains several panels. 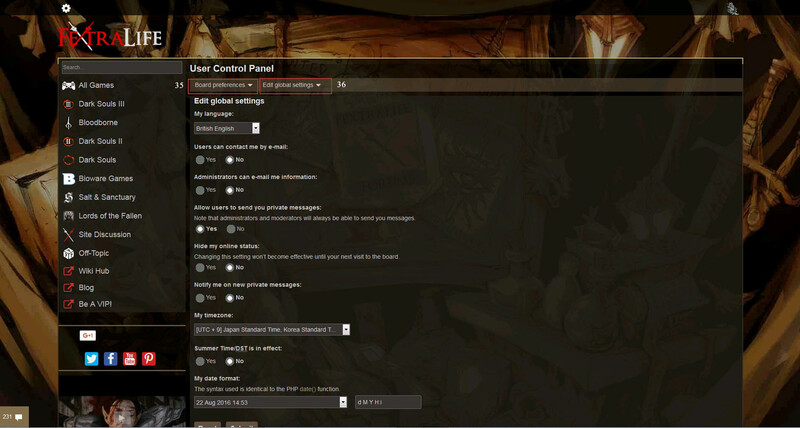 Specific questions regarding bbcode or such are likely covered in the FAQ. Quick Navigation: How to Change your Avatar, Password and email. 5. Forum Categories: Click here to navigate to your preferred category. You can bookmark the URL for each if you want to only ever go there. 7. Global announcements: This includes threads and Blog Articles that are currently important. 8. Board Statistics. If you want to know who is online, go to the bottom of the board. The active topics become all available categories! Clicking any of the names on the left sidebar will take you to its category. 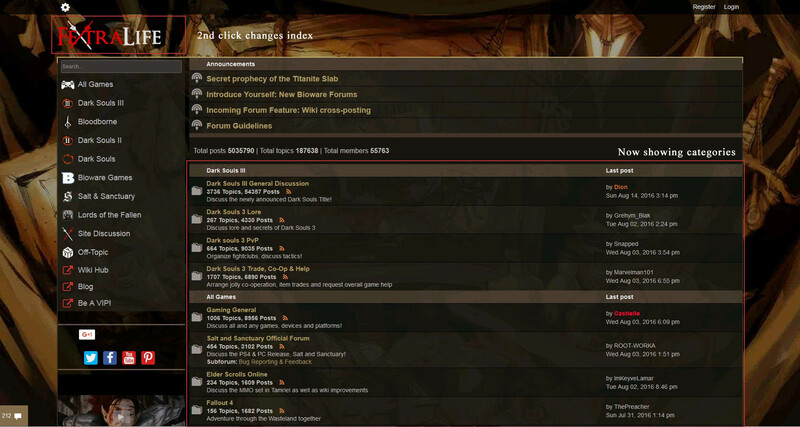 You will now be able to see all subforums within each category "at a glance"
12. 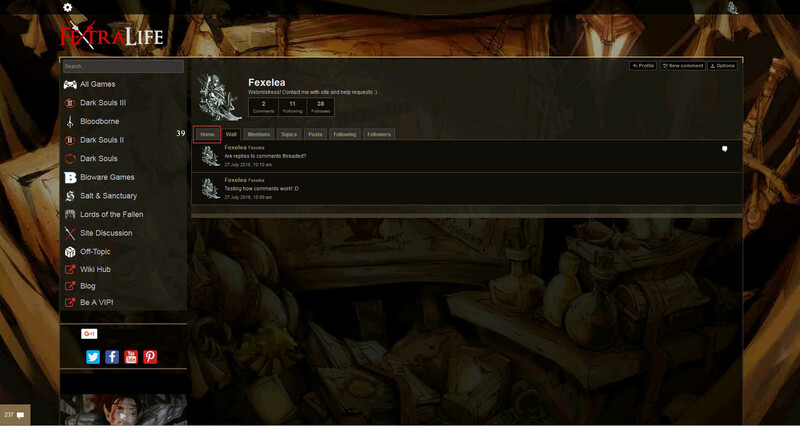 Subscribe to forum (you can chose to be notified of new posts on your User Panel) and "Mark as read"
14. Forum Content. The red icon means "you posted here". Note that on all index, categories and subforums, posts since last visit will be highlighted to a lighter color than default. 25. 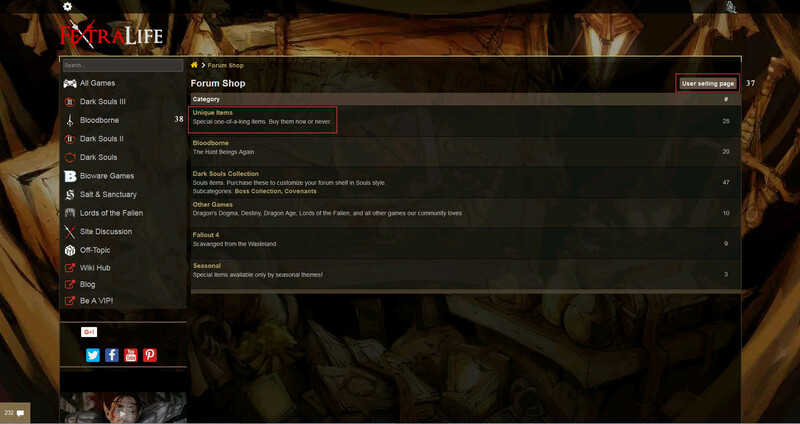 Special VIP shelf - shows owned forum shop items. 26. The reply number. This will change to a bright color if you haven't read this post. 27. Quick Reply Quick BBCode. Just highlight your text and then click these. 33. 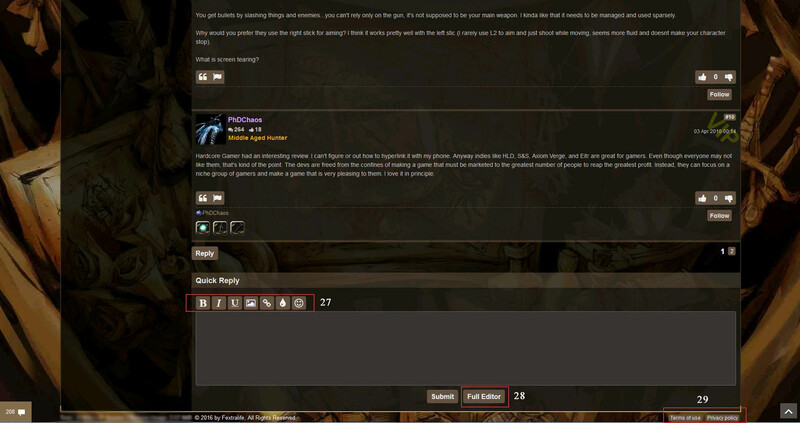 Souls = Manage your forum souls, use your bank, buy lottery tickets, or rob others. All user menus have a "double bar" navigation. Select the "main" navigation on the left, and the "sub-catagory" on the right. 36. Indivual sub-menues for each option. c. Now there are two drop-down menus. From the LEFT menu select "Profile". This alters the right menu, and now you can select "Signature" and "Gamertags" to add your information. c. Now there are two drop-down menus. From the LEFT menu select "Profile". This alters the right menu, and now you can select "Edit account settings" to add your information. c. Now there are two drop-down menus. From the LEFT menu select "Profile". This alters the right menu, and now you can select "Edit Avatar" to add your image. 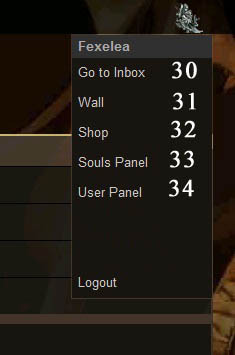 All users can access the shop, where you use your "souls" that you get from posting (and soon from wiki edits). However, only VIP users may purchase items from the shop. 37. Select categories of items. 38. Check out what other users are selling. Your user wall is a great tool for keeping track of users. You can posts comments here, and other users can reply to them. You can do this on their walls as well. You can control over these comments and can delete those you don't want. 39. This feed shows you posts by everyone you follow. It is extremely handy! Keep in mind you can set notification settings for following and mentions via your User Panel. 43. Add a friend and add a foe. If you don't like someone, add a foe and their posts won't be visible to you. And that is about it! Feel free to leave feedback, suggestions and questions as replies to this thread. Is it possible to bring back Souls count at the top of the screen? Yay happy you like it! We could try to reintroduce the counter, but overall we are trying to simplify displays so they look less crowded. A challenge! Everything looks good so far. Am I missing something though? I can't seem to edit my profile picture nor my signature. Is it due to the implementation not being complete? The Archons were the ancient rulers of the Old Kingdom and were said to be immortal. Although the Archons are long gone, their bloodline lives on. You can change those in your user panel. Select signature settings. There currently is no option for "signature settings". 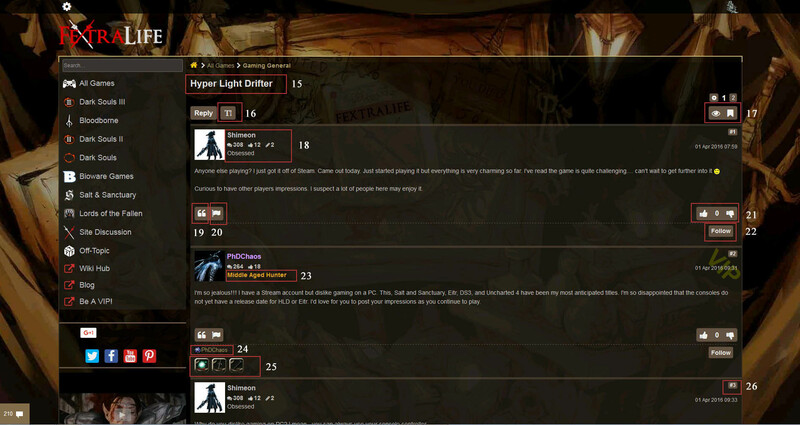 On left menu select "profile"
Little problem I just had: Before the new design, you could only see threads when you were in a subforum (DS3 General), now you can see threads in all higher branches of the forums (DS3). This makes it a bit difficult to write a new thread, or figure out were exactly you are in the hierarchy, since there is no clear difference between sub- and intermediary forum.. 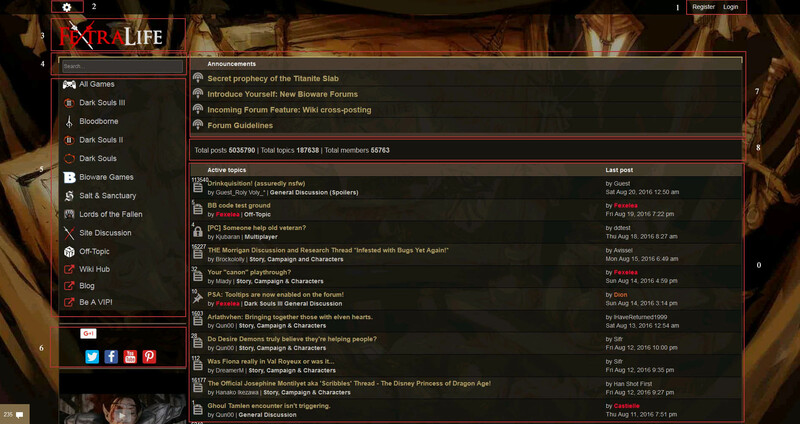 Some sort of different colorisation between subforums and intermediary forums would be nice. Or whatever you think would be good to clearly differentiate between them. Man takes up the sword to protect the small injuries that burdened his heart, on a distant day beyond his memories. Man wields the sword to die with a smile on his face, on a distant day beyond his dreams. 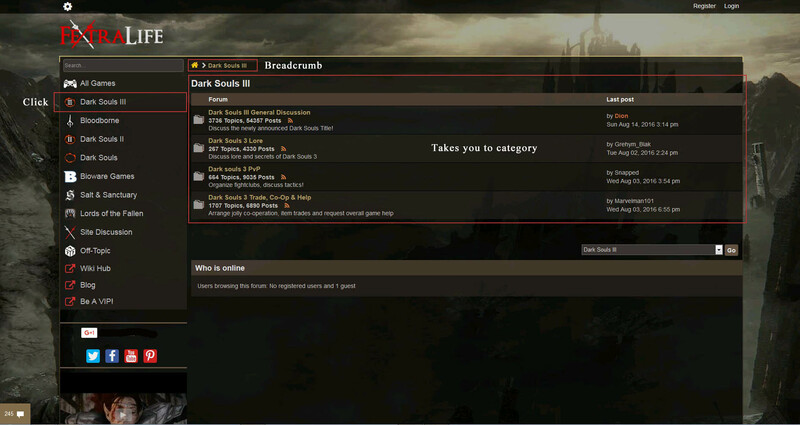 You are looking at the dks3 category perhaps? Just click on each subforum to see its individual threads. If not, I didn't understand what you meant.